I am often asked about nut butters. To be honest I am not a huge fan of them. And here’s why: It takes a lot of nuts to yield a very small amount of nut butter. eg 1.5 cups of almonds yields only a bit more than 1/2 cup of almond butter. So you end up consuming a heck of a lot of nuts in each spoonful of nut butter, much much more than you should typically eat if you were eating whole nuts. And what’s wrong with nuts? In small amounts, for those who don’t have digestive issues or mineral deficiencies, nuts are awesome and in fact ranked as the 3rd most nutrient-dense food on the planet behind organ meats and herbs and spices (according Harvard University Chemist Dr Mat Lalonde. Check out pages 70-71 of Chris Kresser’s book “Your Personal Paleo Code” 2014 for a list of the most nutrient-dense foods). However nuts do contain more omega 6 than omega 3 polyunsaturated fatty acids (which has an inflammatory effect on the body). Secondly, unactivated nuts (ie nuts that have not been properly prepared through soaking and dehydrating) contain phytic acid which leaches minerals from the body and leads to digestive issues. Without doing a full due diligence I bet all store-bought nut butter are made from nuts that have not been properly prepared or “activated” (happy to be proved wrong here). Thirdly, nut butters are typically consumed on bread and I have spend the past decade trying to reduce the amount of gluten (and grains generally for that matter) from my and my kids’ diet. The reasons for this go beyond the scope of this post but contact me should you wish to discuss the relevance and effect of grains on the human body. The occasional consumption of smallish amounts of gluten-free properly prepared grains is fine for those without digestive issues (eg rice, buckwheat). So eating huge amounts of nut butters, especially when the nuts are not activated, involves taking a massive omega 6 and phytic acid hit. It’s is a bit like the orange juice analogy where you end up consuming the fructose equivalent of 5 oranges in 1 glass of orange juice even though you couldn’t possibly eat 5 oranges in one sitting. 2. consume only small amounts eg a couple mouthfuls at a time especially for youngsters. Process ingredients in a food processor for 15 minutes (yes that long!) stopping the food processor every few minutes to scrap down the sides and to prevent the machine from overheating. 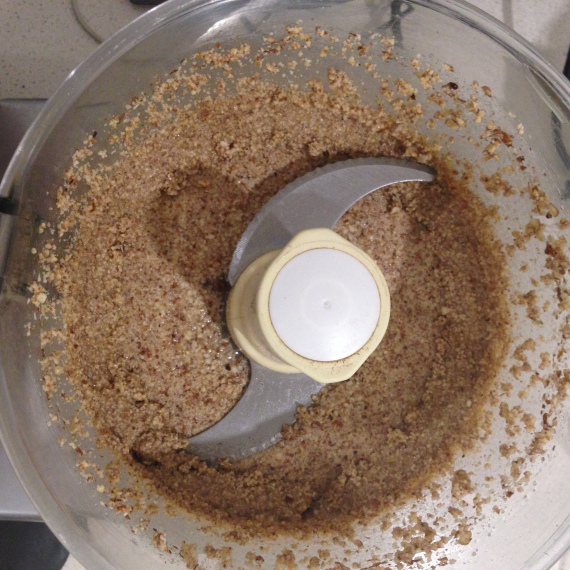 If making larger amounts, add the nuts in batches in the food processor. Some recipes don’t require the addition of coconut oil. I found that without the coconut oil this makes the almond butter really hard to swallow and gets stuck on the back of your throat (hardly pleasant). Because my activated nuts are salted I don’t need to add additional salt. If yours are not salted you might like to add 1/4 tsp salt to the food processor. Eat straight off the spoon as is for a decadent dessert or snack, or with vegetable sticks, or smeared on slices of apple or pineapple, or drizzled onto pancakes or on a slice of traditionally prepared bread (stay tuned for my future posts on various buckwheat loaves – they are still a work in progress). Some add nut butters to their smoothies. You can add a drizzle of honey or maple syrup onto your nut butter (which I did as you can see in the above photo). Nut butters keep for many weeks in a sealed container or jar in the fridge. The downside is that they will go quite hard though in the fridge. They will keep a few days out of the fridge. In this way you can make your own spreads and butters without resorting to expensive store bought varieties. Have you made nut butter before? What ingredients did you use? The photos below show you the transition from whole almonds to almond butter at 4 minute intervals over 15 minutes of processing.